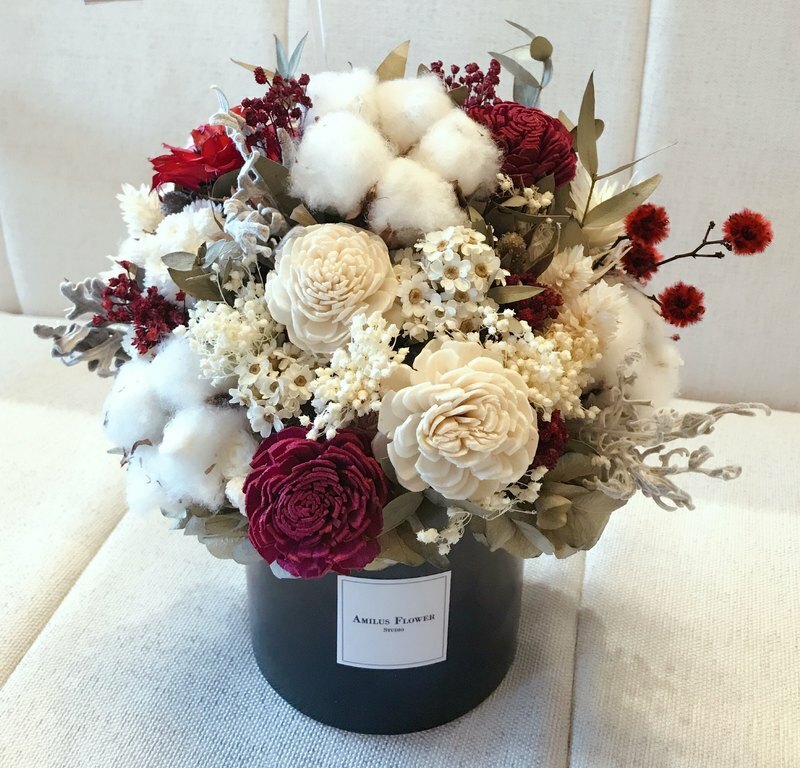 ♥︎ Use of flowers Eternal flowers - Japanese sun rose, hand-made cotton, French white plum, straw cornflower, hydrangea, and other suitable dried flowers. You can customize other colors, welcome message to discuss with designer:) ♥︎ Size Potted flower itself, together with flower instrument width 20X20 cm Be sure to confirm the size before buying! Don't imagine yo! 保存 How to save 1. The best viewing period for dried flowers is about half a year - one year. According to the environment and temperature, some flower materials will be weathered or faded. 2. Dried flowers lose their moisture to air-dried products, which can cause leaves, petals and fruits to fade and peel off over time. This is a natural phenomenon. 3. Do not need to water, avoid moisture and direct sunlight, please save in a ventilated, dry environment, the viewing period can be maintained longer. 4. If it is contaminated with dust, use a soft-bristled brush or brush to gently clean it. ♥︎ Precautions 1. The item is “After Receiving a Receipt”. It will only be created after payment has been made. It will be sent out in about 7 working days (not including holidays). After delivery, please add another 1-2 days. 2. If you are urgent, please confirm the date with the designer first. 3. If you are experiencing a situation where the flowers are out of stock or are not fresh, please agree with the floral designers to replace them with suitable flower materials. 4. If you have special packaging or color requirements, please discuss with the designer before the next order to communicate, to avoid unpleasant situations after purchase. 5. Dry flowers lose their moisture to air-dried products. The delivery process will naturally drop. It is normal. If you are concerned about the ease with which dried flowers can fall, please consider whether or not you ordered them. 6. In order to respond to the care of the earth, all the outer box goods are sent out in used clean cartons.